Rheumatoid arthritis is an autoimmune disease in which the body’s own immune system attacks the joints, creating a great deal of inflammation and pain. Rheumatoid arthritis can be a debilitating disease with a wide variety of symptoms that tend to worsen over time. Some of the symptoms of RA include pain in the affected joints, stiffness, and swelling of the affected joints that comes and goes or gets worse with passing days and weeks. When it’s allowed to progress untreated, RA can eventually lead to an extreme loss of cartilage that will ultimately cause the affected joints to become deformed to the point that simple tasks such as getting dressed prove very difficult. Although a variety of drug treatment options exist for the management of rheumatoid arthritis, they are often accompanied with serious and bothersome side effects. Additionally, prescription treatments for RA may also lose their effectiveness over time, leaving you conflicted about what to do next. Due to the risk of serious side effects or an adjustment to the medications over time that renders them less effective, you may be considering natural treatment options for RA. Below we will highlight some of the more common natural therapies for the treatment of Rheumatoid arthritis and how they can help you in your fight against this condition. Tai Chi was originally developed for self-defense purposes, but it is now widely accepted as a form of exercise that is used to help reduce stress and increase flexibility and proper balance. Tai Chi consists of a series of movements performed in a slow, methodical way and these movements are accompanied by deep breathing to help you center yourself and relax. Because of the fluid, precise, and slow movements that accompany Tai Chi, it is an excellent form of exercise for those who suffer from RA. It is believed that the exercise helps improve blood flow throughout the body as well, which then reduces inflammation and the pain that results from it. Fish oil is naturally very rich in two types of fatty acids that are essential for good health. DHA and EPA are both essential fatty acids that are responsible for reducing inflammation in the body, which causes swelling and pain connected to rheumatoid arthritis. Some studies indicate that fish oil can also help regulate an overactive immune system, which can be extremely beneficial for you if you suffer from RA. Evening primrose oil is extracted from a North American plant that grows in abundance across the US. This oil is rich in omega 6 fatty acids, one of the essential fatty acids known to reduce inflammation, swelling, pain and stiffness often associated with rheumatoid arthritis. Evening primrose oil also contains gamma-linolenic acid, or GLA. As it turns out, GLA is responsible for helping the body to maintain healthy joint cells, thereby proving effective at relieving the symptoms associated with RA. Magnetic and copper bracelets are becoming popular tools in the arsenal against the painful and sometimes debilitating symptoms associated with rheumatoid arthritis. Some studies indicate that wearing jewelry or other items that contain strong magnets is as effective at relieving inflammation and pain than some types of drugs aimed at treating those same symptoms. Inconsistencies between some studies done on the benefits of magnetic therapy for the treatment of painful conditions require that more research be performed, but it appears that the use of a magnets in treating RA and other painful conditions is promising. Thunder God Vine is an herb and the leaves and roots are both used to create a natural treatment that has been shown to reduce the problematic symptoms associated with rheumatoid arthritis and other painful conditions. Thunder god vine has natural anti-inflammatory properties that help reduce the swelling responsible for much of the pain that RA creates. It is also believed that thunder god vine may change the way the body’s immune system reacts to the condition, thereby relieving some of the symptoms associated with it. Many foods and herbs that we cook with on a daily basis can be helpful for the treatment of painful conditions like RA. Ginger is one such herb, and it can be consumed fresh by the root or in dried form. Ginger has been used in a medicinal way in Asia for centuries since it is known to have such powerful anti-inflammatory effects within the body. Some studies have also indicated that ginger can help switch off certain genes in the body that create inflammation, providing yet another avenue of pain relief. And since ginger root offers many other benefits such as relief from nausea and vomiting and improved digestive function, it’s a fail proof way to experience improved health all around. Turmeric is yet another widely known herb that many people use in their daily cooking. 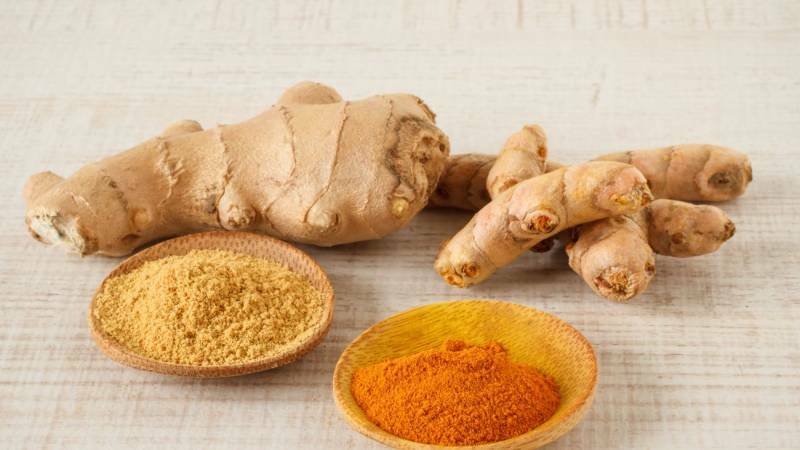 Turmeric is from the same family as ginger, and the two herbs provide many helpful benefits for those suffering from painful conditions like RA. Turmeric contains a compound called curcumin, which is a powerful anti-inflammatory. Turmeric also blocks certain inflammatory enzymes within the body, reducing swelling and pain experienced by rheumatoid arthritis sufferers. Black pepper has also been shown to have certain anti-inflammatory effects within the body. Additionally, black pepper helps the body to break down, absorb, and assimilate the natural compounds found in turmeric, so it is helpful to take the two together for maximum benefits. Garlic is one of the most common herbs used in cooking today, and has been shown to reduce swelling and inflammation within the body as well as help maintain a balanced and healthy immune system. Like its family members leeks and onions, garlic is rich in a natural sulfur compound that reduces swelling and fights pain. Consuming fresh garlic is your best option for treating painful conditions, as the more processed your garlic is, the less potent it becomes. Cinnamon is yet another commonly consumed herb used in cooking. Cinnamon bark contains natural anti-inflammatory compounds that can help reduce swelling and therefore eliminate or reduce pain. Certainly, when combined with other anti-inflammatory foods and herbs, cinnamon can be a useful component of a pain-relieving diet. Cloves are used in combination with cinnamon in many cases, as they have been shown to have very similar anti-inflammatory effects. Cloves also contain compounds that naturally relieve pain, making them useful at stopping existing pain and reducing the swelling responsible for causing the pain in the first place. Green tea has long been known to boost the metabolism and balance the way that the body’s immune system functions. However, green tea also provides many anti-inflammatory benefits, making it a wise choice for those suffering from RA. Polyphenols are joint protective compounds that are heavily concentrated in green tea. Also, since the very basis of the way rheumatoid arthritis works is caused by a dysregulation in the immune system, the balancing effects that green tea has on the immune system can be of huge benefit to RA sufferers. You are most likely all too familiar with the pain-relieving effects of aspirin, and willow bark offers very similar benefits since the two both come from the willow tree. Because it contains a chemical compound similar to that found in aspirin, willow bark reduces swelling and therefore helps to decrease the pain often felt by RA patients. Essential oils have become much more mainstream in recent years, with many varieties now being sold in grocery stores and other retail outlets across the country. Essential oils are created from a variety of plants, herbs and flowers and are bottled in concentrated forms. These oils can then be diffused so that the vapors are breathed into the lungs, or they can be combined with a carrier oil and applied to the body a few drops at a time. Many types of essential oils such as frankincense and myrrh contain natural anti-inflammatory compounds that help reduce swelling and pain. Bee venom is a controversial natural treatment for painful conditions such as rheumatoid arthritis, but it has shown very promising results at reducing pain and swelling. Bee venom contains several compounds, one of which known as melittin, which have been shown to reduce inflammation within the body. Yet another substance in bee venom known as adolapin helps block the way the body receives pain stimuli, thereby reducing the amount of pain felt. It may come as a shock to you that such basic and everyday things that you are already likely familiar with could reduce your rheumatoid arthritis pain and other symptoms associated with this debilitating condition. However, natural cures are not new, and many cultures have relied on things such as these to treat common health conditions for many centuries. While some experimentation may be required to find the best combination and amounts of these natural treatment options to best suit your personal needs, the more anti-inflammatory compounds you choose to include in your everyday life the better your pain will be controlled. We hope this list provides a great place to start as you work at reducing your body’s inflammation and kick starting its natural pain fighting and healing abilities.